History of Earth isn't the only star article → Find more of them! The History of Earth is the development of the planet where humanity lives. According to scientists, the Earth is about 4.56 billion years old (4,560,000,000 years). This age has been determined by measuring radioactive decay, a very complicated but precise way to measure how old something is. The universe itself was created 13.8 billion years ago, by the big bang. So that's three times older than the Earth. The history of the Earth is divided into parts on the geologic time scale. This scale consists of four eons, all of which are divided. The eras on this scale are based on life on Earth, the atmosphere, ice ages, earthquakes and volcanic eruptions, and building the Earth's crust and Earth core. We are currently in the Holocene, an era that started after the final ice age and now 11,700 years. Our Solar System was formed according to scientists from a molecular cloud, a giant cloud of hydrogen and helium, elements that were created by the big bang. There were also some heavier elements in. Those were added by supernovae, big stars that exploded with a giant strength. Such a supernova going close to the molecular cloud. The shock wave struck the solar system 4.6 billion years ago, making the cloud go around in turns and pull together. In the middle clotted a lot of molecules together. There was such high pressure that atoms even coalesced and heavier elements were. These clumping molecules formed the Sun. Meanwhile, clashed in the rest of the cloud remained heavy particles against each other and stick together. There came more and more particles, also of meteors, and this formed the planets, including the Earth. The temperature on Earth was so high that all bricks and metal fused. It seemed so not at all on the Earth by now: the Earth was a sphere lava where you could not breathe. The heavy metals sank to the bottom of the viscous mass of molten metal. This formed the core. The core is very important for the Earth: it makes for a not too cold temperature and gives the Earth a magnetic field, what deadly radiation from outer space. The Moon was born about ten thousand years after the Earth at an event that is called the giant impact. A planet, about as big as Mars, collided with the Earth. By the hit was a lot of material, plunging space, which the Moon formed. The remains of the Earth and the other planet fused together, making the Earth a lot bigger. It's not sure making the oceans were created, but it is thought that there are a whole bunch comets were explosive on Earth, which consisted of ice cream. The ice melted and filled the oceans. Meanwhile, cooled the Earth a lot. This made the lava and the Earth's crust. Light rocks came to the top and heavy stones sank. This gave rise to continents (continents). By the heat difference between the crust and the core were formed Earth plates. Volcanoes were formed by lava by the Earth's crust back broke. These volcanoes kept hitting lots of gas, which formed the first atmosphere. However, there was no oxygen at. No one knows how life on earth began and where it started. But scientists are becoming closer to a remedy. Two things seem certain: life is long ago and the first living things were much simpler than all that lives. Some people believe that living things are specially made and that life on Earth is only a few thousand years old. But virtually no scientist agrees. They think that life is nearly 4 billion years ago when the planet was young. They suspect that it started with random chemical reactions, which eventually living beings. So that might not be all gone on Earth and other planets in the Universe can also have life. Living things are incredibly varied but in the end, they use the same parts to stay alive. They are all out of cells, each of which has a full set of chemical instructions, or genes. Cells look like microscopic vesicles and are surrounded by special membranes that protect them against the outside world. They can use energy from their surroundings, multiply and grow. Genes are even more important. They contain information which is necessary for cells to do and make it work. They can copy themselves and are passed on when cells multiply. To understand how life is started and try scientists to figure out how cells and genes. Both are very complicated in structure, so it is unlikely that they happen to be ready. But maybe they themselves step by step from something very simple. In the course of a long time, random chemical reactions would be the building blocks of life may have formed. More than 50 years ago, American chemist Stanley Miller an experiment in which he mimicked the conditions on the young Earth. Through completely random comments were some of the carbon compounds found in living things. Miller's results were startling, but since then scientists have discoveries that still remarkable. Carbon compounds have been found in subway rites and comets, and even in the ' empty ' space. They are much simpler than any gene and they are definitely not living. But they are the components that make up living things exist. 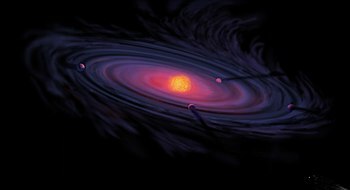 Recently some researchers suggested that substances from outer space life on Earth may be. There should also be living microbes from outer space. But most scientists believe that life on earth itself came to be and that it has developed gradually at sheltered places because carbon compounds were ever more varied and more complex. On the young earth were the continents ravaged by volcanic eruptions, so on the country were complex substances quickly destroyed. But the seas were less inhospitable. Fix chemicals well in sea water and they can react with one another. In the course of millions of years were chemicals with rainwater in sea flushed and had many carbon compounds accumulated. The result was a promising brew that often is called primordial soup. Mixing chemicals In the open sea itself well, intricate molecules can hardly survive. Many scientists think that the conditions on the sea floor or in holes in rocks were better. On the crystals in rocks could maybe large molecules. Possible gave dissolved minerals the energy required was to connect their atoms. Deep sea crater is rich in minerals and therefore, some think that they are the cradle of life forms. In the long period for the beginning of life produced random chemical reactions all kinds of carbon-containing molecules. Some of these molecules may be worked as catalysts, which comments thousands or millions of times accelerated. But at some point there was an extremely important event place: there appeared a molecule that could copy itself and remained alive long enough to enhance. All of the above is based on assumptions that are not to prove. But research shows that life itself then at once started was quickly through the seas. There are fossil bacteria colonies found that 3.4 billion years old. Their bloom time has long since passed but living bacteria colonies still exist though. During the long history of life, there are millions of different types emerged. But they all have the same cell membranes and their genes use exactly the same chemical code. So it is almost certain that the living beings of now a distant common ancestor, which long ago in the sea has come to life. The first living creatures were formed about a billion years after the Earth was formed. Living things have water and protein. Water was there, only proteins yet. Proteins consist of amino acids, and these existed. These amino acids to proteins that somehow grew knew how they could reproduce by splitting itself in two. How amino acids could grow we do not know. Perhaps by lightning strikes, ultraviolet radiation from the Sun, or volcanoes. The first living organisms were single-cell, just like bacteria now. We now have two of the four eons of the geologic time scale (see the introduction), the Archean and Hadean. Life developed further in the Proterozoic. This took two billion years, to 500 million years ago. At this time formed the continents further and there were some ice ages, but the most important development was multicellular life. The first living organisms were unicellular forms with only DNA. But in the Proterozoic, various organelles in the cell, all of which have a private task. These creatures were already a lot more complicated, but still single-cell. It took one and a half billion years before multicellular organisms. Also important was that in the Proterozoic oxygen in the atmosphere. There were namely blue algae that oxygen made of light. This created also the ozone. After multicellular organisms arose ended the Proterozoic, the Phanerozoic Eon started. The first part of this eon was called the Paleozoic Era and its first period the Cambrian. In the Cambrian Period came the development of new kinds of animals on a coaster. It went very fast. So fast, that we speak of the Cambrian explosion. During the Cambrian explosion the first animals with a backbone: fishing. Also gave rise to plants on the country. Before that, it was the country bare. In the rest of the Paleozoic insects, amphibians, and were the first land animals that could lay eggs (where later mammals, reptiles, and birds came out for). The Mesozoic Era was the time of the dinosaur Sen. the first birds and mammals laid eggs from animals that were formed. This era was divided in the Triassic, Jurassic, and Cretaceous. During this era, the supercontinent broke Pangaea from each other towards the continents we know today. The dinosaurs were and are the largest animals ever to have walked on the Earth. At the end of the Cretaceous hit, an asteroid in the Gulf of Mexico causing the dinosaurs became extinct. When the dinosaurs were gone the mammals could evolve. They spread around the Earth and became the new dominant species. This time is called the Cenozoic Era and is the time in which. The Human Evolution is the process in which you can see how man has been developed. Sixty million years ago gave rise to the primates or great apes. Today there are still living primates, such as the chimpanzee and gorilla. Six million years ago there lived a kind of ape that is the ancestor of chimpanzees and humans. Humans and chimpanzees both arose out of this ape-like. The first true Humanoids, there were two million years ago. They walked upright, used stone tools, and had a large brain content. They got all the generic name Homo, which indicates that they are Humanoids. There lived various types of Homo like the Homo erectus and Neanderthal. Meanwhile, we're in the stone age and know people how they fire. They live in groups, hunting, make cave paintings, and already have a kind of language. 200,000 years ago in the Middle East the Homo sapiens, the modern human, like you and me. This was smarter than other Humanoids and spread all over the world. Other species, such as the Neanderthals, died as a result. 12,000 years ago found the agricultural revolution. As a result, people were farmers. 5,500 years ago gave rise to the first cities, and the writing. The initial version of this article is translated from this version of the article Geschiedenis van de Aarde on WikiKids.nl.